Pinterest has the ability to share all types of content. One content that is overlooked at times is videos and podcasts. Are you pinning your podcasts to Pinterest? The better question might be are you making images for your users to be able to pin your content for you onto Pinterest? If the answer is no you are leaving a huge gap in your marketing strategy for your videos, podcasts and even your periscopes and blabs. 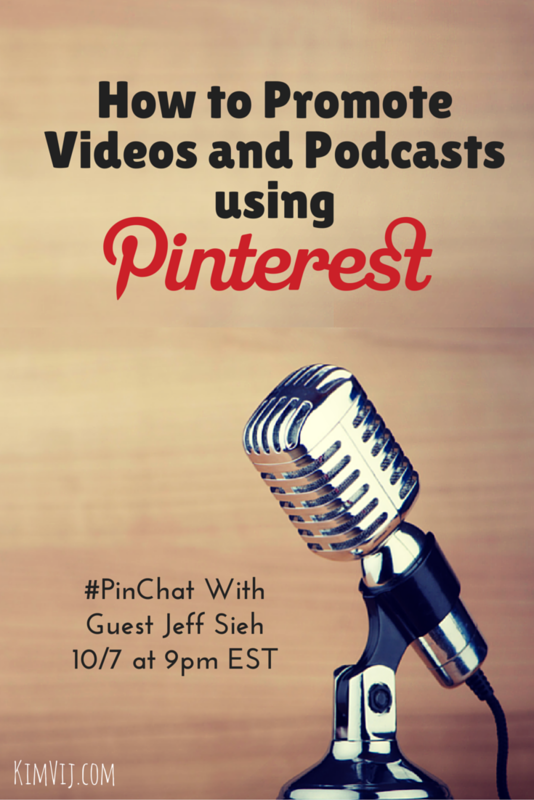 In this week’s #PinChat we’ll be discussing how to market your videos and podcasts on Pinterest. Kelly Lieberman and I are excited to welcome Jeff Sieh as our PinChat Guest this week. Jeff is the Creative Director at His Design, Inc. and Head Beard at Manly Pinterest Tips where he is the creator and host of The Manly Pinterest Tips Show. With top tips, pop culture, comedy and just plain fun, he teaches Pinterest techniques unlike any other. His catch phrase is “Adding testosterone…one pin at a time” You can find him hosting his own Google Hangouts on Air and podcasts and sharing great tips on his blog and newsletter. I had the chance to connect with Jeff in a Google Handouts on Air this past year Educating with Pinterest. And then we had the chance to meet in person at Social Media Marketing World. Did you see all of the Pinterest rockstars that were there! Click here to see more. 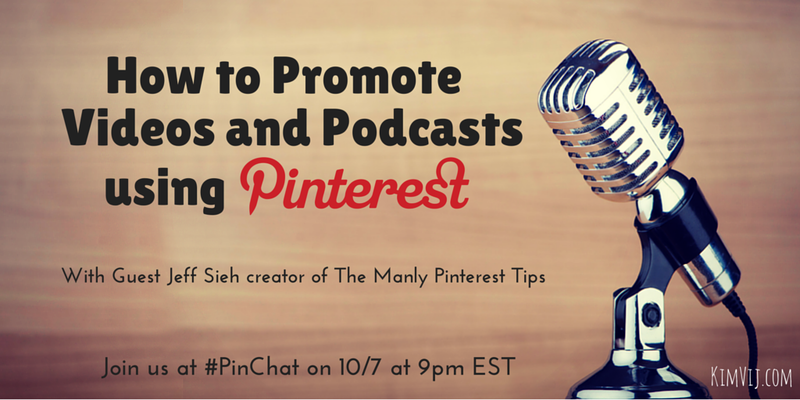 This week’s Twitter chat we’ll be sharing our thoughts on how to use Pinterest to promote videos, podcasts and more! Hope you can come join us and ask quesitons and share your thoughts too on what’s working for you. Have your heard? Grab a ticket for the upcoming ONLINE Visual Social Media Conference that Jeff Sieh is organizing with Alissa Meredith and Vincent Ng. I’m thrilled to be one of the speakers presenting at it as well about Pinterest. The best part is there is no traveling involved, you can join from your computer live or recorded and get tips from some of my favorite speakers. BE SURE TO USE THE CODE KimVij to get your DISCOUNT!